Presently, Agriculture is emerging out as a famous stream among the students for pursuing higher education. There are various courses offered in the field of agriculture. Students have options to pursue undergraduate, postgraduate and doctoral level courses in this field. For admission in agriculture courses, students have to clear the entrance exam organized at national, university or state level. 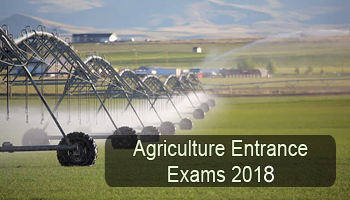 Here we are providing complete details about Agriculture Entrance Exams 2018. The Indian Council of Agricultural Research (ICAR) organizes the AIEEEA examination. It is a national level exam organized for providing admissions into UG and PG agriculture programmes. The application forms will be available via online and offline mode in the month of April 2018. The examination will be organized in the month of May 2018. Bihar Combined Entrance Competitive Examination also referred as BCECE is a state level examination organized by the BCECE Board. Through this examination, students will get admissions in B.Sc (Agriculture) courses offered by various colleges in Bihar state. Candidates can fill the application form in the month of February 2018. Jharkhand Combined Entrance Competitive Examination Board owes the authority to conduct the JCECE examination. It is a state level examination, which is conducted for admissions into first year of degree level professional courses in the agriculture, engineering and other fields. The application form will be released in the month of April 2018. Karnataka Examination Authority organizes the KCET (Karnataka Common Entrance Test) examination. This examination is the gateway for admissions in agriculture courses offered by different colleges and institution in the state of Karnataka. The examination will be conducted in the month of May 2018. Candidates can apply for this exam from January 2018 month. Kerala Engineering, Agriculture and Medical (KEAM 2018) is a state level entrance test organized by the Commissioner of Entrance Examination (CEE), Kerala. This examination is conducted for providing admission to students in agriculture, engineering and other courses. The application form will be released in the month of February 2018. MP PAT is also known as Madhya Pradesh Pre-Agriculture Test is organized by the Madhya Pradesh Professional Examination Board. Aspirants looking for admissions into B.Sc (Agriculture) and B.Tech (Agriculture) may appear for this examination. The application form will be provided in the month of March 2018. OUAT exam is organized by the Orissa University of Agriculture and Technology (OUAT). It is a state level examination conducts for the selection of students in UG, PG and doctoral courses. These courses are offered in the field of agriculture, horticulture, veterinary science, animal husbandry, agriculture engineering and technology, fishery science, home science and forestry. TS EAMCET (Telangana State Engineering, Agriculture & Medical Entrance Test) is a state level examination regulated by the Jawaharlal Nehru Technological University, Hyderabad. Various colleges of Telangana consider the TS EAMCET score for providing admissions in agriculture, engineering and other courses. The application form will be provided in the month of February 2018. Jawaharlal Nehru Technological University, Kakinada conducts the state level examination known as AP EAMCET. This examination is an opportunity for those students seeking for admission in agriculture, engineering, pharmacy and other courses offered by various colleges of Andhra Pradesh state. The exam will be conducted in the month of April 2018. The LPU NEST (Lovely professional University National Eligibility and Scholarship Test) is a university level examination regulated by LPU University. Through this examination, students will get admissions into various agriculture, engineering and many other courses offered by LPU. Candidates can fill the application form in the month of December 2018. Bharti Vidyapeeth Deemed University offers different UG and PG courses in the field of agriculture, law, nursing and many others. This university organizes various entrance examinations for providing admission to students in various courses. The examination will be conducted in offline mode (pen and paper based mode). SAAT (Siksha ‘O’ Anusandhan University Admission Test) is a university level entrance test organized by the Siksha ‘O’ Anusandhan University. This examination is organized for selecting students for admissions in agriculture and other courses offered by SAAT and its other campuses. The examination will be organized in the first week of May 2018. Aligarh Muslim University (AMU) organizes entrance examination for providing admissions into UG and PG courses in the field of agriculture, law, engineering and many other fields. Candidates will get admission in various courses on the basis of their performance in the entrance test. The application form will be available in the month of January 2018. Allahabad University (University of Allahabad) is situated in Uttar Pradesh state. This university conducts the UGAT, PGAT and other examinations for providing admissions. It offers admissions into diploma, UG, PG and other courses in the field of agriculture, law and many others. The application form will be released in the third week of April 2018.